The Malayan tapir weighs about 250 - 300 kg (550 - 660 lb). It utilizes various forested habitats, including swamp, lowland, montane and hill forest and prefers dense primary rainforest. Its diet includes grasses, aquatic plants, leaves, buds, soft twigs and fruits of low-growing shrubs. The Malayan tapir is primarily nocturnal. It travels long distances in search of food, habitually using the same paths. It climbs steep slopes well. Since it likes to bathe and wallow, it is often found around water and forms steps in river banks leading into the water. The Malayan tapir is found in lowland areas in the dry season and moves into mountainous areas with the rainy season. It is usually solitary, except for a female with young. The Malayan tapir occurs in southern and central parts of Sumatra (Indonesia), Myanmar (south of latitude 18° N), Malaysia, and Thailand (along the western border and on the Peninsular down to the Malaysian border, and in Huai Kha Khaeng Wildlife Sanctuary in northern Thailand). It is also thought to occur in southern parts of Cambodia and Vietnam, and possibly Laos. It still occurs throughout its historical range. However, it has been depleted throughout this range due to capture for the live animal trade, overhunting, and habitat loss, with remnant populations surviving in isolated habitats. *** The Malayan tapir will apparently feed in disturbed forest, but not if primary forest is available. *** All tapirs are good hill climbers and swimmers. *** Tapirs are among the most primitive large mammals in the world. Their closest relatives are the horses and rhinoceroses. The Malayan tapir occurs in southern and central parts of Sumatra (Indonesia), Myanmar (south of latitude 18° N), Malaysia, and Thailand (along the western border and on the Peninsular down to the Malaysian border, and in Huai Kha Khaeng Wildlife Sanctuary in northern Thailand). It is also thought to occur in southern parts of Cambodia and Vietnam (although reports from this area are unconfirmed), and possibly Laos. (IUCN 2006) Although it still generally occurs throughout its historical range, it has been depleted, with only remnant populations surviving in isolated habitats. It is increasingly confined to the more remote mountain tops. The Malayan tapir weighs 250 - 300 kg (550 - 660 lb). 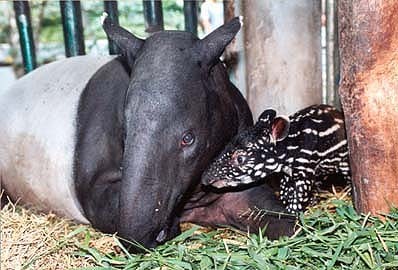 The Malayan tapir utilizes various forested habitats, including swamp, lowland, montane and hill forest. It prefers dense primary rainforest, near water bodies such as streams or swamps. Breeding occurs in April - June, with the young being born about 13 months later. 1 calf per litter. The time between births is probably 2 years. The young calf stays with its mother for 6 - 8 months, by which time it is nearly adult size. The Malayan tapir's diet includes grasses, aquatic plants, leaves, buds, soft twigs and fruits of low-growing shrubs. Green shoots are preferred. The Malayan tapir is primarily, although not exclusively, nocturnal. It travels long distances in search of food, habitually using the same paths. It climbs steep slopes well. Since it likes to bathe and wallow, it is often found around water and forms steps in river banks leading into the water. The Malayan tapir is found in lowland areas in the dry season and moves into mountainous areas with the rainy season. It had been thought that the Malayan tapir is usually solitary, except for a female with young. However, recent observations from as far apart as Sumatra, Belize, Costa Rica, Ecuador and Brazil suggest that in all four species of tapir, wild tapirs behavior patterns include much more companionship activity than previously believed, with a number of adult tapirs being observed traveling in pairs (Todd & Matola 1998) .